Invariant NK T cells express certain NK cell receptors and an invariant TCRα chain specific for the MHC class I-like CD1d protein. These invariant NK T cells can regulate diverse immune responses in mice, including antitumor responses, through mechanisms including rapid production of IL-4 and IFN-γ, but their physiological functions remain uncertain. Invariant NK T cells were markedly decreased in peripheral blood from advanced prostate cancer patients, and their ex vivo expansion with a CD1d-presented lipid Ag (α-galactosylceramide) was diminished compared with healthy donors. 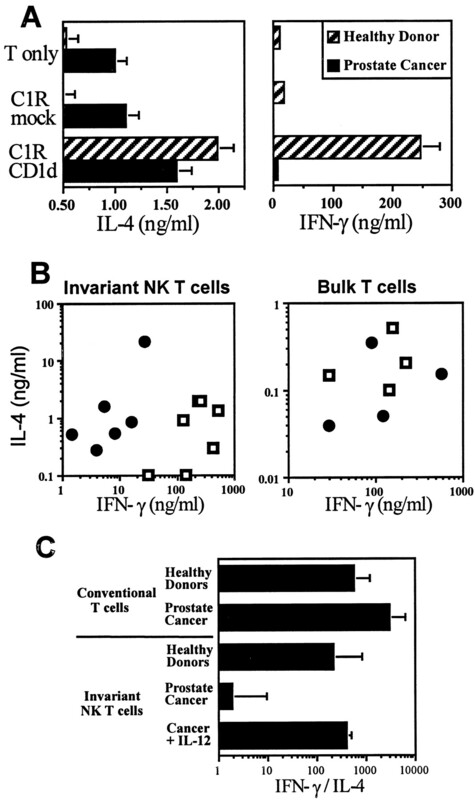 Invariant NK T cells from healthy donors produced high levels of both IFN-γ and IL-4. In contrast, whereas invariant NK T cells from prostate cancer patients also produced IL-4, they had diminished IFN-γ production and a striking decrease in their IFN-γ:IL-4 ratio. The IFN-γ deficit was specific to the invariant NK T cells, as bulk T cells from prostate cancer patients produced normal levels of IFN-γ and IL-4. These findings support an immunoregulatory function for invariant NK T cells in humans mediated by differential production of Th1 vs Th2 cytokines. They further indicate that antitumor responses may be suppressed by the marked Th2 bias of invariant NK T cells in advanced cancer patients. Natural killer T cells are a heterogeneous population defined in mice by their expression of cell surface proteins associated with NK cells, in particular NK1.1 (CD161) (1). A major subset of murine NK T cells express a semi-invariant TCRα chain, generated by precise Vα14-Jα281 rearrangements with no N region diversity. These invariant NK T cells are CD4+ or CD4−CD8− and they specifically recognize the MHC class I-like CD1d protein (1, 2). Humans similarly have a population of CD161+, CD4+, or CD4−CD8−, CD1d-reactive T cells that use a homologous invariant TCRα chain (Vα24-JαQ) associated with Vβ11-encoded TCRβ chains (3, 4, 5, 6). The physiological CD1d-presented Ag recognized by these cells has not been identified, but human and mouse invariant NK T cells can be specifically activated by a CD1d-presented synthetic glycolipid, α-galactosylceramide (α-GalCer),3 which was originally isolated from marine sponges in a screen for novel antitumor agents (7, 8). Invariant NK T cells are the source of IL-4 produced rapidly in response to T cell activation in vivo by anti-CD3 and they may contribute to the initiation of Th2-like immune responses (9, 10, 11, 12). These cells are also required for the induction of immune tolerance in response to Ags administered into the anterior chamber of the eye, an immune-privileged site (13), and for induction of allograft tolerance (14, 15). Reductions in the number of circulating NK T cells and loss in their IL-4 production have been reported in certain human and murine autoimmune diseases, including type 1 diabetes mellitus, that are linked to relative increases in cellular Th1-like immune responses vs humoral Th2 responses (16, 17, 18, 19, 20). Recent murine studies further suggest that NK T cells can suppress antitumor immune responses (21, 22). In contrast to this evidence for roles in promoting Th2 immunity and tolerance, other data strongly support a role for NK T cells in stimulating Th1-like responses. Results in several murine infection models indicate that invariant NK T cells augment protective cellular Th1-like immune responses (23, 24, 25, 26, 27). Studies with Jα281 knockout mice, which specifically lack invariant NK T cells, indicate that invariant NK T cells contribute to antitumor immunity and the antitumor effects of IL-12 (28, 29, 30, 31). Moreover, in vivo stimulation of invariant NK T cells with α-GalCer stimulates IL-12 production, NK cell activation, and augments antitumor responses (32, 33, 34, 35). Murine and human invariant NK T cells may also have NK-like cytotoxicity and can function as CD1d-specific cytolytic T cells (36, 37, 38), although it is not clear to what extent they function in vivo as direct effectors of antitumor responses vs functioning through cytokine production and activation of other effector cells. Although these studies in murine model systems support an immunoregulatory function for invariant NK T cells, the role they play in augmenting or suppressing human immune responses, and in particular antitumor immune responses, remains to be determined. One study found that CD161+Vα24+ T cells were decreased in patients with melanoma, but could be activated by α-GalCer (38). We report in this study that invariant NK T cells are markedly decreased in patients with advanced prostate cancer. Moreover, although the remaining invariant NK T cells could produce high levels of IL-4, they were strikingly deficient in their production of IFN-γ. These findings strongly support an immunoregulatory function for invariant NK T cells in human cancer. The marked Th2-like bias of invariant NK T cells in advanced cancer further indicates that this immunoregulatory function is compromised and may contribute to ineffective endogenous antitumor responses and decreased responses to vaccines and other immunotherapies. Patients in this study had advanced androgen-independent prostate cancer (39, 40). All were treated previously with androgen ablation therapy by orchiectomy or administration of a leutinizing hormone releasing hormone agonist. At the time of study, all had positive bone scans and rising levels of prostate-specific Ag (PSA; >10 ng/ml), indicative of progressive metastatic disease. All but one patient had not received cytotoxic chemotherapy. Prostate cancer patients in remission were similarly treated with androgen ablation therapy, but had negative bone scans and stable low (<10 ng/ml) levels of PSA. Peripheral blood (10–20 ml) was drawn in heparin-containing tubes from healthy donors and prostate cancer patients, after obtaining informed consent. PBMCs were isolated using Ficoll-Paque (Amersham Pharmacia, Uppsala, Sweden) and Vα24-positive T cells were stained with an anti-Vα24 mAb (C15; Coulter, Miami, FL) (4) followed by a goat anti-mouse IgG (H + L) FITC conjugate (Kirkegaard & Perry Laboratories, Gaithersburg, MD), and were sorted by high speed FACS (Modular Flow FACS; Cytomation, Fort Collins, CO). Autologous PBMCs were irradiated (5000 rads) and used as APCs. The FACS-purified Vα24+ cells were initially cocultured in 96-well flat-bottom plates (∼20,000 per well) with equal numbers of autologous irradiated PBMCs in the presence of α-GalCer (50 ng/ml, KRN7000; Kirin Brewery, Gunma, Japan) and rIL-2 (100 U/ml; National Cancer Institute, Bethesda, MD). Cultures were then gradually expanded into 24-well plates, using the same medium. In some cultures, human rIL-12 (1 ng/ml; Genetics Institute, Cambridge, MA) was added during the last week of culture. Phenotypic analysis of α-GalCer expanded cells was performed by two- or three-color flow cytometry after 3–4 wk in culture. Previous reports have shown that dual staining for Vα24 and Vβ11 is a marker of invariant NK T cells, as Vα24 and Vβ11 are used very infrequently by bulk T cells (4, 5, 6). Abs used were anti-Vα24 PE, anti-Vβ11 FITC, anti-CD8β PE (Immunotech, Westbrook, ME), anti-CD3 CyChrome, anti-CD161 PE, and anti-CD4 CyChrome (BD PharMingen, La Jolla, CA). As described previously (5, 36), ∼1 × 106 cells were suspended in 50 μl of FACS buffer (PBS with 1% FBS and 0.1% NaN3) in single wells of 96-well plates. Nonspecific Ab binding was blocked by preincubating cells with 10% human serum for 15 min on ice. Abs were then added to cell suspensions and incubated for 20 min on ice. Cells were then washed twice with FACS buffer, and analyzed using a FACScan (BD Biosciences, Mountain View, CA) with CellQuest Software. The analysis of invariant NK T cells in freshly isolated PBMC from healthy donors and cancer patients used an additional invariant TCR-specific mAb, 6B11, which was raised in CD1d knockout mice against a cyclic peptide based upon the human invariant TCRα chain, CDR3 (M. A. Exley et al., manuscript in preparation). In these experiments, cells were stained with 6B11-FITC and anti-Vα24-PE (which did not cross-compete) to detect cells expressing the invariant TCR. Due to the low frequency of these cells in cancer patients, between 105 and 106 total cells were analyzed. For cytokine production, 1 × 105 cells/well in 96-well plates were cocultured with an equal number of CD1d or mock-transfected C1R cells in RPMI 1640 medium with 10% FBS, 20 U/ml IL-2, and 1 ng/ml PMA, as described previously (5). Cellular responses to CD1d were blocked with an anti-CD1d Ab, 51.1 at 10 μg/ml (5, 41). Supernatants were collected at 48 and 72 h for IL-4 and IFN-γ measurements, respectively. Released cytokine levels were determined in triplicates by capture ELISA with matched Ab pairs in relation to cytokine standards (Endogen, Cambridge, MA). The limit of detection range of these assays for both IFN-γ and IL-4 was 10–50 pg/ml. Invariant NK T cells in the peripheral blood of healthy donors and cancer patients were quantitated by two-color flow cytometry with a Vα24 mAb and a Vβ11 mAb or the 6B11 mAb against the invariant Vα24-JαQ TCR (M. A. Exley et al., manuscript in preparation). Invariant NK T cell lines, generated by α-GalCer expansion of Vα24+ T cells from healthy donors, were reactive with Vα24, Vβ11, and 6B11 mAbs (Fig. 1⇓, NK T cell line). The observation that Vβ11 was expressed by virtually all of the α-GalCer-expanded Vα24+ T cells from this and multiple other healthy donors (see below) further indicated that this Vβ was necessary to generate α-GalCer-reactive invariant NK T cells. Invariant NK T cells are diminished in peripheral blood from advanced cancer patients. Peripheral blood from a healthy donor or prostate cancer patient, or an NK T cell line, was analyzed by two-color flow cytometry with Vα24-PE and Vβ11-FITC or 6B11-FITC mAbs. The NK T cell line was generated by α-GalCer expansion of Vα24-purified cells from a healthy donor. Vα24+Vβ11+-double-positive T cells were found in the peripheral blood of healthy donors in numbers that were comparable with Vα24+6B11+ cells, consistent with a large fraction of Vα24+Vβ11+ cells being invariant NK T cells (Fig. 1⇑, healthy donor). 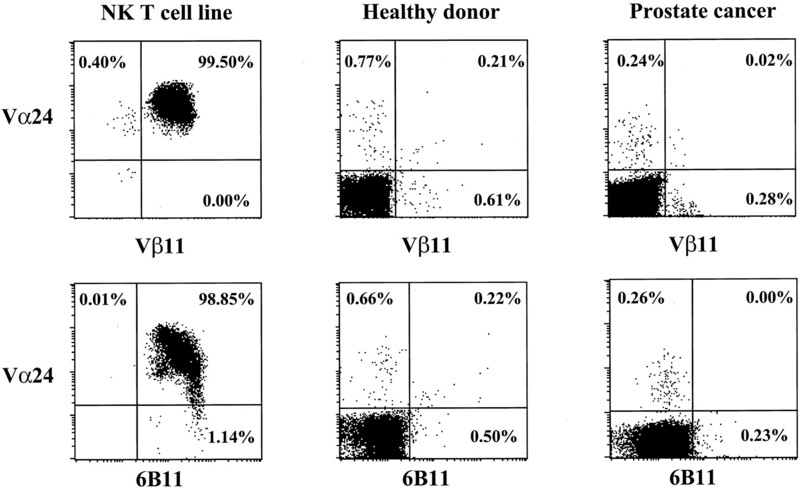 The average fraction of Vα24+6B11+ cells in a series of healthy donors was 0.11%. 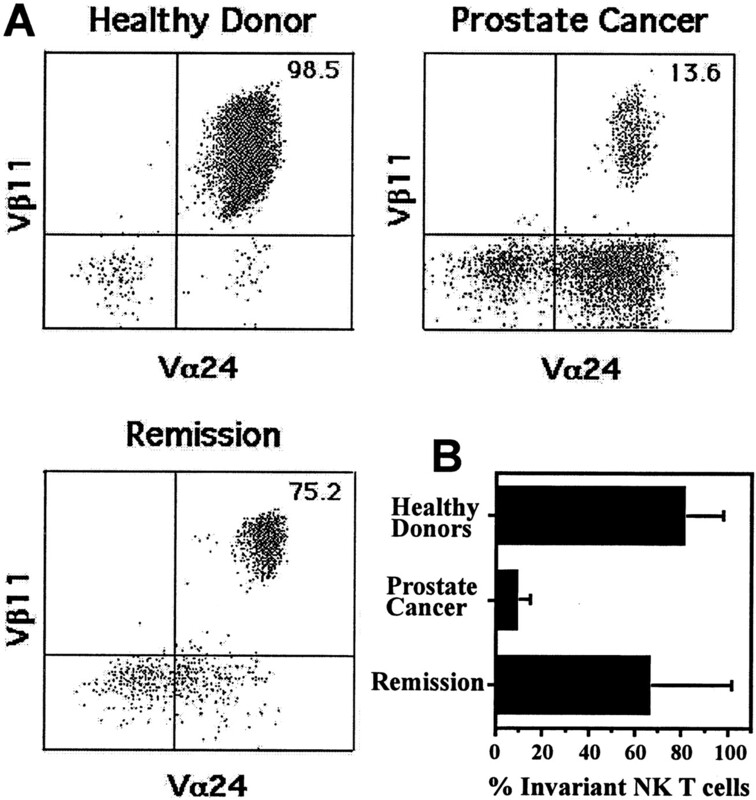 Smaller numbers of Vα24+Vβ11+ T cells were found in the peripheral blood of advanced prostate cancer patients. Moreover, there were no detectable Vα24+6B11+ cells in five of six patients examined (Fig. 1⇑ and data not shown). These results indicated that invariant NK T cells were decreased in advanced prostate cancer patients. Due to the small numbers of invariant NK T cells in peripheral blood, one round of ex vivo expansion was conducted to further assess the frequency and function of these cells. Invariant NK T cells from healthy donors and advanced prostate cancer patients were isolated from peripheral blood through an initial FACS purification with a Vα24-specific mAb, followed by selective expansion in vitro for 3–4 wk with α-GalCer and autologous-irradiated PBMCs as a source of APCs. 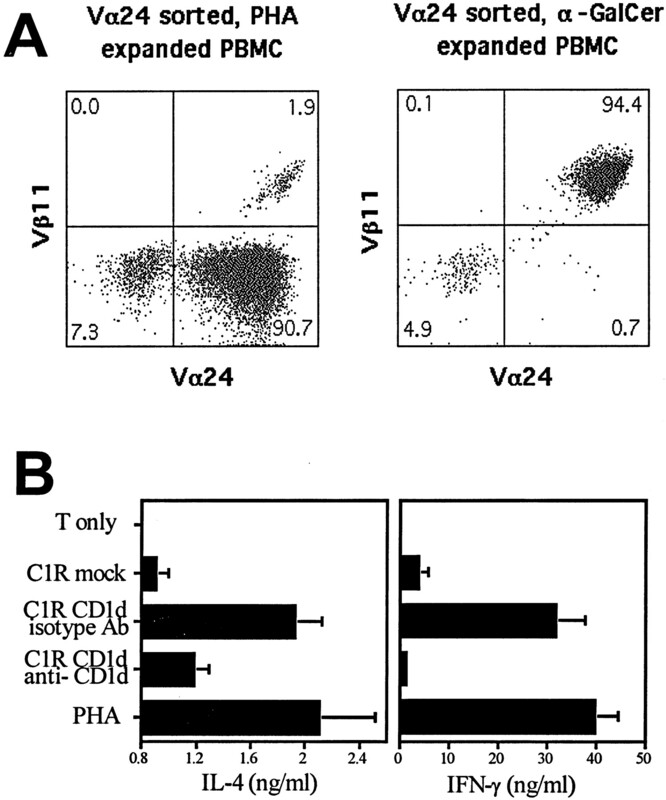 T cells were then analyzed by dual staining with Vα24 and Vβ11 or 6B11 mAbs. FACS-purified Vα24+ T cells stimulated in vitro with a T cell mitogen, PHA, yielded only a minor population of Vα24+Vβ11+ T cells, which varied in number with different donors (Fig. 2⇓A). In contrast, stimulation of the purified Vα24+ T cells from healthy donors with α-GalCer and autologous-irradiated PBMCs yielded a major Vα24+Vβ11+ population (Fig. 2⇓A, 94.4% of total cells). Additional phenotypic analyses of these α-GalCer-expanded Vα24+Vβ11+ T cells from a series of healthy donors demonstrated major CD4+ and CD4−CD8− populations, and showed that the majority from each donor (>70%) expressed CD161 (data not shown). Invariant NK T cells are readily expanded from healthy donors and produce IL-4 and IFN-γ in response to CD1d. A, Two-color analysis with Vα24-PE and Vβ11-FITC mAb of Vα24-sorted cells after a 3-wk expansion with PHA (left panel) or α-GalCer and autologous PBMC feeders (right panel). B, IL-4 and IFN-γ production by invariant NK T cell line stimulated with mock-transfected or CD1d-transfected C1R human EBV-transformed B cells in the presence of anti-CD1d mAb (51.1, 10 μg/ml) or isotype control, or stimulated with PHA. Results in both A and B are representative of multiple healthy donors, as shown below. The α-GalCer-expanded Vα24+ Vβ11+ T cells from healthy donors were assessed for CD1d recognition and cytokine production. Consistent with many of the cells being CD1d-reactive invariant NK T cells, the cells produced substantial quantities of both IL-4 and IFN-γ in response to CD1d-transfected C1R cells, but not mock-transfected C1R cells (Fig. 2⇑B). The CD1d specificity of this recognition was further demonstrated by blocking with an anti-CD1d mAb, 51.1, but not an isotype-matched control Ab. The cytokine responses to CD1d were equivalent to those obtained after polyclonal stimulation of these T cells with PHA, confirming that most of the cells were indeed CD1d-reactive T cells. These responses were all comparable with those obtained previously with invariant NK T cell clones from healthy donors (5, 36), indicating that these latter in vitro-established clones reflected the functional status of the cells in vivo. Invariant NK T cells from patients with advanced androgen-independent prostate cancer were examined similarly. Relative to the healthy donors, there was a consistent decrease of ∼5-fold in the total number of cultured cells recovered from patients with advanced androgen ablation refractory prostate cancer (not shown). Moreover, there was a marked decrease in the fraction of expanded cells that were Vα24+Vβ11+-invariant NK T cells (Fig. 3⇓A, 98.5 vs 13.6% invariant NK T cells in a healthy donor and androgen ablation refractory prostate cancer patient, respectively). Also shown are α-GalCer expanded-Vα24+ T cells from an androgen ablation-treated prostate cancer patient in remission (75% invariant NK T cells), indicating that the androgen ablation therapy did not account for the decreased expansion of invariant NK T cells. Decreased expansion of invariant NK T cells from prostate cancer patients vs healthy donors. A, α-GalCer-expanded invariant NK T cells from a healthy donor (upper left panel), advanced prostate cancer patient (upper right panel), and prostate cancer patient in remission (lower left panel) analyzed by Vα24-PE and Vβ11-FITC staining. B, The percentage of Vα24+Vβ11+ cells (mean and SD) after α-GalCer expansion from a series of healthy donors (n = 7), prostate cancer patients (n = 6), or patients in remission (n = 3). Data from a series of patients with advanced androgen-independent prostate cancer, all with metastatic disease and rising levels of PSA, confirmed the markedly diminished recovery of Vα24+Vβ11+-invariant NK T cells (mean of 10% from prostate cancer patients vs >80% from healthy donors; Fig. 3⇑B). These results were consistent with the decreased numbers of invariant NK T cells detected by Vα24 and Vβ11 or 6B11 staining in peripheral blood of the advanced prostate cancer patients, but other factors, including decreased proliferation or increased apoptosis during the in vitro stimulations, could have contributed to the lower recovery. In contrast, the recovery of Vα24+ Vβ11+-invariant NK T cells from prostate cancer patients receiving androgen ablation therapy, but who were in remission, was closer to the healthy donors (Fig. 3⇑B). CD1d-specific responses and cytokine production by α-GalCer-expanded invariant NK T cells from prostate cancer patients were next assessed. Similar to healthy donors, prostate cancer patient-derived invariant NK T cell lines proliferated (data not shown) and produced IL-4 in response to CD1d-transfected cells (Fig. 4⇓A, left panel). Basal IL-4 production was also observed in some lines, but the level was augmented by CD1d. In contrast to the IL-4 results, production of IFN-γ was markedly reduced relative to invariant NK T cells from a healthy donor (Fig. 4⇓A, right panel). Analyses of CD1d-stimulated IL-4 vs IFN-γ production by α-GalCer-expanded invariant NK T cell lines from a series of advanced prostate cancer patients and healthy donors confirmed the decrease in IFN-γ production by the cells derived from prostate cancer patients (Fig. 4⇓B, left panel). As this decrease could reflect differences in the number of invariant NK T cells in the lines and fraction of these cells responding to the CD1d stimulus, the ratio of IFN-γ to IL-4 produced by each line was assessed. This showed a striking loss of IFN-γ relative to IL-4, with a difference of ∼50-fold in the IFN-γ:IL-4 production ratios between the prostate cancer- and healthy donor-derived NK T cell lines (Fig. 4⇓C). Loss of IFN-γ responses by invariant NK T cells from prostate cancer patients. A, IL-4 and IFN-γ production from prostate cancer patient- vs healthy donor-derived invariant NK T cell line. B, Summary of cytokine production results by CD1d-stimulated invariant NK T cell lines (left panel) or PHA-stimulated bulk T cell lines (right panel) from a series of advanced prostate cancer patients (•) and healthy donors (□). The invariant NK T cell points reflect CD1d-stimulated cytokine production and are not normalized for the fraction of cells in the cultures expressing the invariant TCR. C, IFN-γ:IL-4 ratios (mean + SD) for invariant NK T cells (below) or conventional bulk T cells (above) from healthy donors and advanced prostate cancer patients. Cancer + IL-12 are samples from advanced prostate cancer patients treated in vitro with IL-12. To determine whether this loss of IFN-γ production was common to other T cell populations, bulk peripheral blood T cells from advanced androgen-independent prostate cancer patients and healthy donors were stimulated in vitro with PHA. The results showed that IFN-γ production by bulk T cells from prostate cancer patients was intact (Fig. 4⇑B, right panel), with similar IFN-γ:IL-4 ratios observed in the cells from prostate cancer patients vs healthy donors (Fig. 4⇑C). Taken together, these data demonstrated a selective loss of IFN-γ production in the invariant NK T cell population from advanced prostate cancer patients. As invariant NK T cells may contribute to the antitumor effects of IL-12, it was next determined whether these cancer patient-derived cells could respond to IL-12. Prostate cancer-derived invariant NK T cells were treated with IL-12 (1 ng/ml) during the last week of culture to determine whether they could respond to this cytokine. The IL-12-treated cells showed a marked increase in IFN-γ production, and had ratios of IFN-γ:IL-4 production that were comparable with those in the healthy donors (Fig. 4⇑C, cancer + IL-12). Immunodeficiencies of varying degrees have been reported previously in advanced cancer patients, but consistent underlying immune defects have not been identified (42). This study supports a function for invariant NK T cells in human antitumor immune responses, and indicates that this function is compromised in advanced prostate cancer by loss of these cells and by a strong Th2 bias (high IL-4 and low IFN-γ) in the remaining cells. Moreover, this Th2 bias may impede both endogenous antitumor responses and responses to tumor vaccines and other forms of immunotherapy that rely on stimulating strong Th1 immune responses. Together with a report showing decreased numbers of Vα24+ CD161+ T cells in melanoma (38), this suggests that loss of invariant NK T cell function will be a general finding in advanced cancer. An increase in IL-4 production relative to IFN-γ by invariant NK T cells was reported previously in mice after multiple treatments with α-GalCer, and was associated with Th2-biased immune responses (43, 44). However, this study provides the first evidence in humans or mice for the development of a Th2 bias (high IL-4:IFN-γ ratio) by invariant NK T cells in a physiological or disease setting. A previously described functional change in invariant NK T cells was loss of IL-4 production in type 1 diabetes mellitus, which was linked to Th1-biased immune responses and disease progression in identical twins discordant for the disease (20). Although the Th1 and Th2 biases observed previously in diabetes and in this study in cancer may be pathological, they likely reflect an extreme in the spectrum of invariant NK T cell responses to normal immunological stimuli. Therefore, these findings strongly support a physiological role for human invariant NK T cells in regulating both Th1 and Th2 immune responses through mechanisms including selective local production of Th1 or Th2 cytokines. Activated invariant NK T cells express IL-12 receptors and can induce dendritic cells to produce IL-12 through IFN-γ production and CD40/CD40 ligand interactions (32, 33). The IFN-γ loss observed here in prostate cancer patients appeared to be intrinsic to the invariant NK T cells, as substitution of α-GalCer-treated allogeneic-irradiated PBMCs from healthy donors did not restore IFN-γ production (data not shown). Therefore, the restoration of IFN-γ production by exogenous IL-12 suggests a defect in the ability of invariant NK T cells from cancer patients to induce dendritic cell IL-12 production, a hypothesis that is currently being tested. In any case, these results indicate that invariant NK T cells may be an important target of IL-12 treatment in advanced cancer clinical trials (45). Current efforts are focused on development of a clinical trial of autologous in vitro-expanded and IL-12-activated invariant NK T cells to test whether these cells can augment endogenous antitumor responses or responses to tumor vaccines. For advice, reagants, or comments on the manuscript, we particularly thank Drs. M. Brenner, J. Gollob, S. Herrmann, K. LeClair, and S. Porcelli. We also thank Genetics Institute for IL-12. ↵1 This work was supported by the National Institutes of Health (Grant AI42955 to S.P.B.) and by the Hershey Family Prostate Cancer Research Fund. ↵3 Abbreviations used in this paper: α-GalCer, α-galactosylceramide; PSA, prostrate-specific Ag.